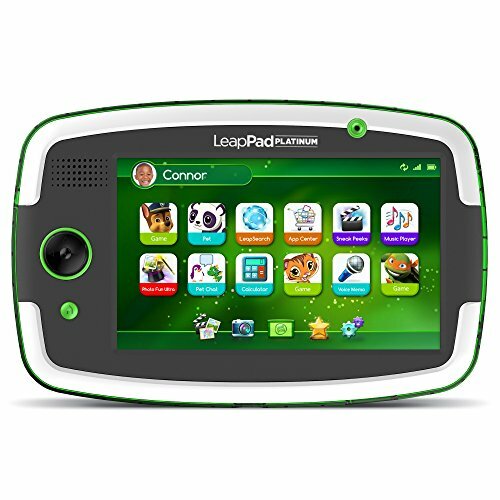 LeapFrog has unveiled a new version of its LeapPad tablet, the LeapPad Platinum, a 7-inch tough-ish tablet designed for kids ages between 3-9 years old . As well as being the company's best yet, it also contains the wizardry that will thrill young'uns for hours. Unlike the iPad or some Android tablets that are pretty much designed to shatter on impact with the ground, the LeapPad can handled a bit of a beating straight out of the box. It's certainly coped with our three kids during testing. Here's what we make of the LeapPad Platinum. The biggest of the LeapPad tablets, the Platinum's 7-inch screen also supports the highest resolution to date from the company, and although the 1024 x 600 pixel resolution is nowhere near the clarity of most smartphones or "grown up" tablets, it is certainly a lot better than the earlier models. Sadly the bigger screen doesn't equal more battery life. We've found around five hours of play before you'll be reaching for the charging cable to plug it back into the wall. Although that should give your child plenty of time to play (then get bored, play, and then get bored again, as was the case with our test subjects) we'd still like greater longevity per charge. Aside from the new bigger and better screen, the LeapPad Platinum features a 1Ghz processor and offers 8GB of storage. That's plenty to store games, videos, and various pictures that either your kids have taken using the front and rear cameras (both 2-megapixel) or made through the various LeapPad apps. Some game apps come pre-installed, but additional ones from the App Centre do cost, varying from £2 and upwards (some £10 or more), so things can get pricey. There is also an included Stylus to make things like writing on the screen easier. And yes, you'll be pleased to know this comes with a small cord attached to the main tablet device so it won't get lost within the first 10-minutes of use and reappear some weeks later from the back of the sofa. The on-board cameras are also used for a new augmented reality (AR) feature that LeapFrog is calling LeapFrog Imagicard. In the LeapPad Platinum box you get six demo cards to give you an idea of what the experience is about. Ultimately the Imagicards are used to interact with games on the screen. It's great fun and gives an air of magic, especially for the younger children in your family. For example, when playing Paw Patrol the Imagicards can be used to unlock gameplay within the game - it's just a case of pointing the camera at the right card to unlock the action, which helps your child use their brain rather than haphazardly guessing. While in the case of LeapFrog Imagicard Letter Factory Adventures, that means finding the right letter to spell a word. However, you'll need more cards to play all the games. At present you can get three further games (around £20 each) with maths and English their target learning subjects. LeapSearch is a child-safe web browser on the LeapPad that provides access to safe web content which has been curated just for kids. If that sounds like a minefield then fret not, it isn't. Rather than a standard browser with "safe search" turned on, you don't actually get a URL bar to access any old website. Instead the curated collection of content - including specific sites, videos, images and more - are all that your children can access when surfing the web on this particular tablet. There's hours of content too, as deemed appropriate by LeapFrog. If you're still worried - and from what we've seen of the experience it shouldn't - you can disable Wi-Fi all together, along with a number of other settings, and your child won't then have access. That's one of the key features of the LeapPad Platinum: the parental control going on behind the scenes. Locked away out of reach of small fingers you, as an admin if you will, have the capacity to control a number of things including which apps are shown on the home pages, whether kids can see or access the App Centre, and even time-based controls to limit when the LeapPad Platinum works. It's the last one that's really clever as you can state that the kids can play for two hours, for example, with a countdown timer letting them know how much longer they have left. We've found that this removed the "Dad is the bad guy" element. However, it's not possible to utilise this play time in sections, so playing for 30-minutes and then going off to do something else doesn't mean 90-minutes will remain upon return. One of the great things about the LeapPad Platinum tablet is that it's always focused on education, even if for young kids it might feel more like fun. Everything is geared towards building your children's creativity, to get them to learn without realising it, and basically make them the goody two shoes of the class. That's great, however the lure of your iPad might be so strong that older kids will tire of the Platinum because the graphics aren't exciting enough, the experience can feel a bit like school, and because it doesn't have Minecraft, Clash of Clans or many other things. We would therefore advise those with slightly older kids to steer clear. As an educational device aimed at young kids the LeapPad Platinum is fantastic, with any niggling safety concerns easily taken care of. Just don't let your kids get used to any snazzier tablet around the house, otherwise insisting they go back to their LeapFrog might be a hard battle.